Campers will experience various stations, specializing in fundamental skills of basketball. 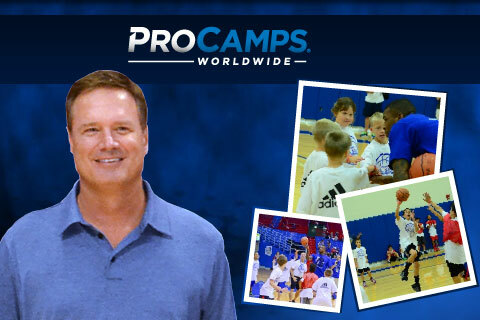 Campers will participate in games, stations, and skill contests during the Bill Self Basketball ProCamp. Each camper will be placed on a team according to his or her age. Self will give talks highlighting the finer points of the game of basketball and beyond. Parents and guests will be able to listen to camp guests in designated areas at each location. Watch the following video where Kansas Head Coach Bill Self is speaking with the media on March 08, 2014 following the team’s 92-86 loss to the Mountaineers Saturday at the Coliseum, and talks about Juwan Staten being the best guard in the Big 12. Bill Self has been the men’s basketball coach at Kansas since 2003. He led the Jayhawks to the 2008 National Title and was named AP Coach of the Year in 2009. Self is also a popular motivational speaker and keynote speaker and is available for speaking engagements, charity fundraisers, marketing campaigns, personal appearances & corporate events. If you would like to book Bill Self for a speaking engagement or personal appearance, you can contact Bill Self’s booking agent for appearance fees at Playing Field Promotions.